Inflatable climbing, also known as inflatable sports, stimulates the brain's learning ability by touching rocks, stretching limbs and swinging the body. Clinical trials have shown that "" climbing" "is a good activity that can improve sensory integration in children. The fun of inflatable rock climbing can enhance a child's physical strength, hands, feet, grip, balance, high adaptability, concentration, motivation, hand-eye coordination and rhythm. 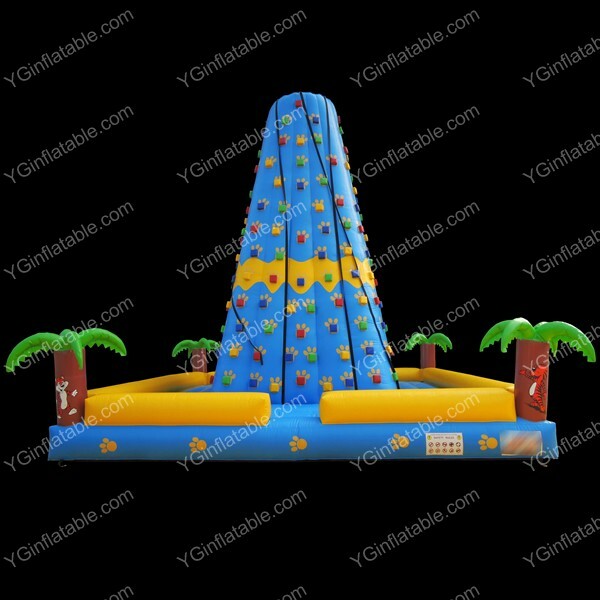 Inflatable castle inflatable climb is to train children to overcome difficulties of courage and confidence. Research institute education in Europe and the United States has confirmed that climbing is very important for the physical and mental development of children and adolescents. Inflatable climbing is a good exercise. It can improve the child's self-affirmation and confidence in overcoming difficulties. And this constant pursuit of self-challenge is more conducive to the positive development of personality than ordinary activities. Children are natural climbers, and when they learn to walk, they often climb tables, chairs, steps, trees, walls and other objects. The child's instinct must be stimulated by activities, games and competitions to form a sound capacity and character. If children overclimb for safety reasons, they may grow up unable to adapt, have the willpower to overcome difficulties, or often become dizzy from fear of heights. Therefore, children climbing is a necessary physical and mental process. What adults should do in the face of children's natural desire to climb is to enhance safety protection, provide children with a safe climbing environment, and then let children climb, inflatable climbing is the best choice.